Product Spotlight: CanDo® Inflatable ABS Ball - Fabrication Enterprises Retail Sales Corp. Exercise balls are a versatile tool used to improve balance, coordination, flexibility and strength. They can even be used just for fun. With the CanDo® Inflatable ABS Ball, exercising can be fun and safe. This is because the new ABS ball, the inflatable ball won’t instantly pop if accidentally punctured. Instead it will slowly release air, providing a safe and secure workout experience for all users. As with any CanDo® Inflatable Ball, ABS balls are used as aids for vestibular movement and equilibrium therapy by fitness professionals an aid for stretching and strength programs. They’re also used as seats, and by pregnant women in birthing classes. These CanDo® balls feature a non-slip PVC vinyl surface that is ribbed for extra security. You can “under” inflate your ball for a soft, mushy feel or fully inflate it for a firm, bouncy feel. Additionally, these ABS inflatable exercise balls are made with a material that is specially formulated to release air slowly if a sharp object like a pen or pencil accidentally punctures it. 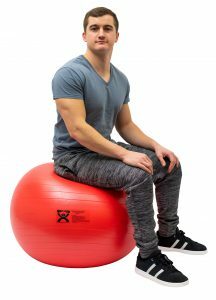 CanDo® Inflatable ABS Ball are great for a variety of exercises including sitting. Use ABS balls to get a good workout during work by just sitting on them or perform exercises with them at home or at the gym. As mentioned in our article earlier this week, an inflatable ball is great for working out all parts of the body to stay in shape. To see if using the CanDo® Inflatable ball is right for you, please consult your specialist. To view our selection on CanDo® Inflatable ABS Ball, click here.